When you are on a tight budget and fully faired motorcycle is your first choice, Indian motorcycle market offers just 3 options under INR 1.25 lakh. Honda CBR150R and Hero Karizma Series is not on-sale in India (temporarily discontinued). 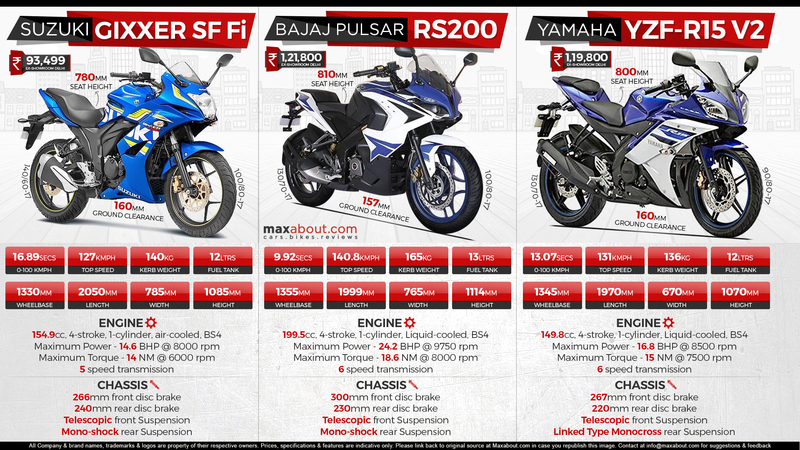 Two are from 150cc category while Bajaj offers RS200 in the same price bracket. The most affordable one if Suzuki Gixxer SF, offering both carburetor and fuel injected option with full fairing. For the convenience of comparison, the model considered here is the one with fuel injection. It can be bought for INR 93,499 while the one with carburetor costs just INR 89,659. The 154.9 cc, single cylinder engine on the motorcycle is good for 14.6 BHP and 14 Nm of torque. If you can raise your budget to around INR 1.20 lakh, Yamaha offers the evergreen R15 with an excellent engine, chassis and lightweight aerodynamic body. The 149.8 cc engine on the motorcycle is good for 16.8 BHP and 15 Nm of torque. If you feel the power figures to be lower than expectation, going for RS200 would be the best option. The 199.5 cc, fuel injected and liquid cooled engine on the motorcycle is good for 24.2 BHP and 18.6 Nm of torque. Apart from that, it comes out as the only option out of three to claim an under 10 second sprint from 0-100 kmph. It comes with a price tag of INR 1,21,800. Click here to know more about Suzuki Gixxer SF Fi. Click here to know more about Bajaj Pulsar RS200.